In fact, many Augustans get out of town. They spend weeks, months even, cleaning out closets, sprucing up yards, and stocking up on new sheets and towels, in preparation for renting their house. It’s a lot of work, but it’s all worth it when you get a big, tax-free check from the renters. Because we had a monsoon on Monday, you’ll be glad you listened to me. I’ve had many friends who insisted on wearing cute shoes to match their outfit. They were the first ones to slip and fall in the stinky mud out there. If it happens, I can promise none of your friends will leave the tournament, so you’ll be forced to walk around with what looks like a bad potty accident up the back of your precious seersucker. For the first time since 1994, before he was an amateur, Tiger won’t be here. Like him or not, it’ll be noticeable. Ticket scalpers will tell you about the direct correlation between Tiger’s performance (or attendance) and sale prices. I won’t miss his cheering section. It’s like a wrestling match. Don’t get me wrong. There’s nothing better than the loud roar that follows a flawless putt. It’s the “Get it in the hole!” or “You da man, Tiger!” as soon as he tees off that is borderline offensive. Don’t bring your phones or cameras. They ain’t kidding. Once Wednesday is over, no cameras allowed. Cell phone s are never allowed. Really, people. Never. There’re several banks of courtesy phones around the course, and you can pretty much call China for free. “How will I find my people,” you ask? Set a time, pick a place, and meet up. It’s like the olden days. You’ve got this. Quiet is misspelled on the sign. Not a great way to show off our state. Um…I don’t get how it’s funny? 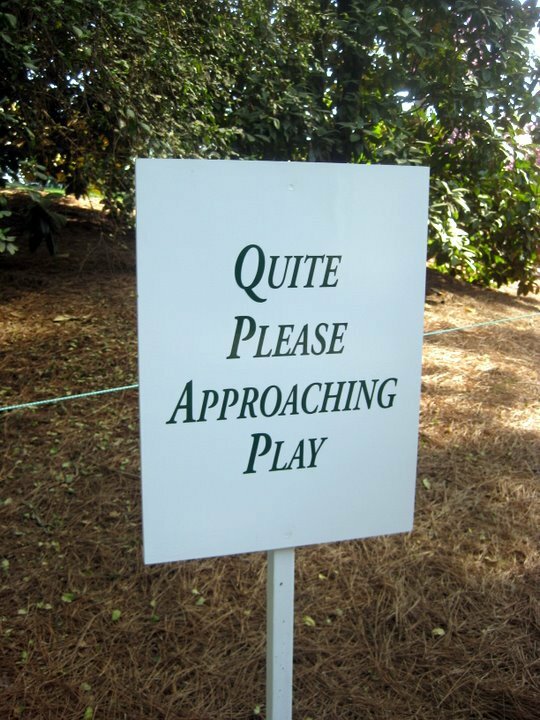 I mean…it still shows a sign at the prestigious tournament spelled wrong. You strive so hard to promote Augusta all the time. I’m surprised you found the humor in it. I just took it as totally lighthearted – just like this column. People make little mistakes everywhere. Doesn’t lessen their value or prestige. We will just have to agree to disagree! 🙂 thanks for reading! Love reading your column! Didn’t mean to come across harshly or anything. Hey…I make mistakes daily! Ha! I look forward to reading your post-tourney report. I think you were reading my mind when you wrote this. Good read! Good times! Good week! Happy Masters! as I said, forget the masters ( blasphemy, I know,) come to Fl. and sit with me by my pool !